They say it’s the little things in life that bring us the most pleasure. 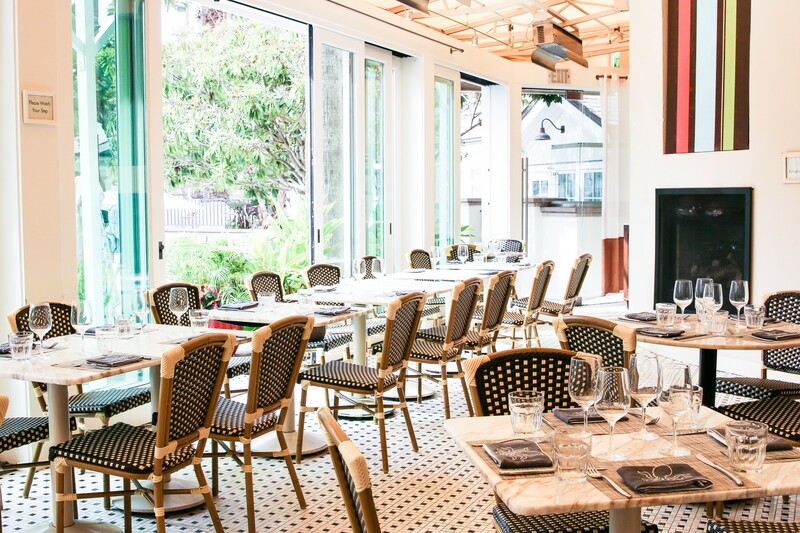 And at FIG, the all-day cafe inside The Fairmont hotel in Santa Monica, that little thing is the best happy hour on the Westside. Every Tuesday-Saturday, for one truly happy hour (5pm-6pm), nearly the entire FIG menu is 50% off. The food is solid, the atmosphere is chill, and the drinks are quite stiff. Let’s get at it. Prior to visiting FIG, we associated The Fairmont hotel with another establishment housed on the hotel grounds, The Bungalow. You may also know it as the land of former sorority girls, as*holes, and really old guys. FIG is an extreme contrast to the rowdy, obnoxious crowd that infiltrates Bungalow. It’s tucked off the hotel lobby and has a quiet, casual California vibe that appeals to people who have some self-respect. The menu is seasonal and all ingredients are locally sourced, so it changes frequently. (We know, like every other place in LA.) You can easily eat alone at the bar, with a bigger group in the main dining room, or outside on a small patio overlooking the hotel pool. Sitting on the patio means you will stare at Euros in aggressively small bathing suits, but nothing says happy hour like a French guy in a translucent speedo. The generous happy hour discounts also extend deep into the beer and wine stock. Heck, even bottles. If you want to order 15 bottles, pop them, and pour them on yourself, that’s cool with us. FIG is a solid restaurant at any point in the day, but we’ll go on paper as saying it’s a personal crime to visit outside the hours of 5pm-6pm. So plan it out, arrive on time, and don’t miss one second of this hour-long bliss. Or the Frenchman in that speedo. Like we said, it’s the little things. The cheese and meat selection here is pretty extensive and can be a little daunting so we let the good people of FIG select them for us. And when it comes to meat and cheese, they know what’s up. The goat cheese from Sofia, Indiana is our favorite and you weren’t expecting to read that at the end of a charcuterie blurb. Crispy and served with Harissa and garlic mayo. We could write three pages declaring our love for these fries. The fiery chili paste mixed with the garlic mayo was like nothing we’ve ever had. Just when you thought avocado toast couldn't be more of a cliche, they throw spicy shrimp on it. Pretty standard for charred octopus. It’s on the smaller side and is served with caper berries, butter beans, sherry vinegar and mint. We enjoyed the butter beans. This comes with Kalamata olives, Calabrian chilis, pine nuts, and Tahini. This was a little soggy, but we didn’t sweat it because it was 50% off. Next time, we’re getting extra fries. The Santa Monica location doesn’t have the magic of the original Ktown location, but El Cholo is still fun and serving solid old-school Mexican food.